If you are considering becoming a registered Therapy Team with your animal, here is some good stuff to know. Before you can begin the process, you and your animal must have good foundational obedience skills including a reliable “sit”, “down”, “stay”, “come when called” and “leave it”. Your animal should be able to walk at your side with a loose leash. Most importantly, you and your animal must have a great relationship! Below is a list of dog trainers who support these methods and work hand-in-hand with CAREing Paws and CAREing Paws Teams. Camp Canine USA provides reward-based training programs and behavior counseling for family dogs. Our programs are designed to provide fun, exciting, happy, stress-free, positive experiences and results for both dogs and their life caregivers. Canine Country Academy, LLC exists to improve relationships between dogs and owners. At Canine Country Academy, LLC we strive to show you and your dog how to better relate to one another using respect, communication and cooperation. Utilizing only positive reinforcement training methods, you may be confident that you and your dog will be treated with kindness, compassion and understanding. Canine Country Academy, LLC utilizes a variety of positive reinforcement tools in our training, which helps build a better relationship between dog and owner and provides positive based solutions for your dog’s behavioral or obedience issues. Teaching owners how to communicate with and understand your dog’s language is a key component to our methods. Canine PhD is devoted to creating the best relationship between people and their companions. We are professional and progressive dog trainers who encourage positive learning. Through higher-education, we promote happy and healthy dogs. We are dedicated and determined to help difficult dogs with special needs. 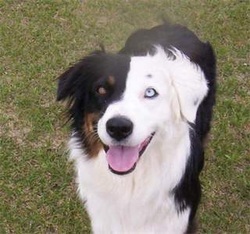 Daisy’s Canine Academy specializes in turning your ordinary dog into an extraordinary dog! From basic to advanced obedience and beyond, Daisy can help your dog to reach his full potential. If you are hoping to train your dog to become a therapy or service dog, you’re in the right place. 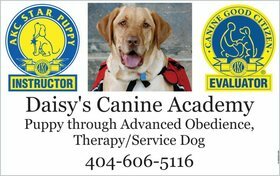 Daisy’s Canine Academy is mobile and can help you to train your dog on your schedule. Whether in a group setting or private lesson, Daisy can help you and your dog to be an incredible team! At Delightful Dog, we use science based training, exercises & positive interaction as a proven method of benefiting animals. This is our main focus & philosophy! Melony has been a professional Dog Trainer and Training Instructor for over 8 years. Using proven positive training and behavior modification techniques, she works to facilitate a happy, healthy relationship between dogs and their human families.